One of the newest tactics in search engine optimization utilizes strategies that have been used for years. This new method of intentionally restructuring websites helps content marketing teams increase SERP rankings and also has the benefit of improving user navigation on site. This new SEO strategy is named topic clustering for some pretty obvious reasons. Topic Clustering is a way to link content pages to a central, high traffic page, also known as a pillar page. 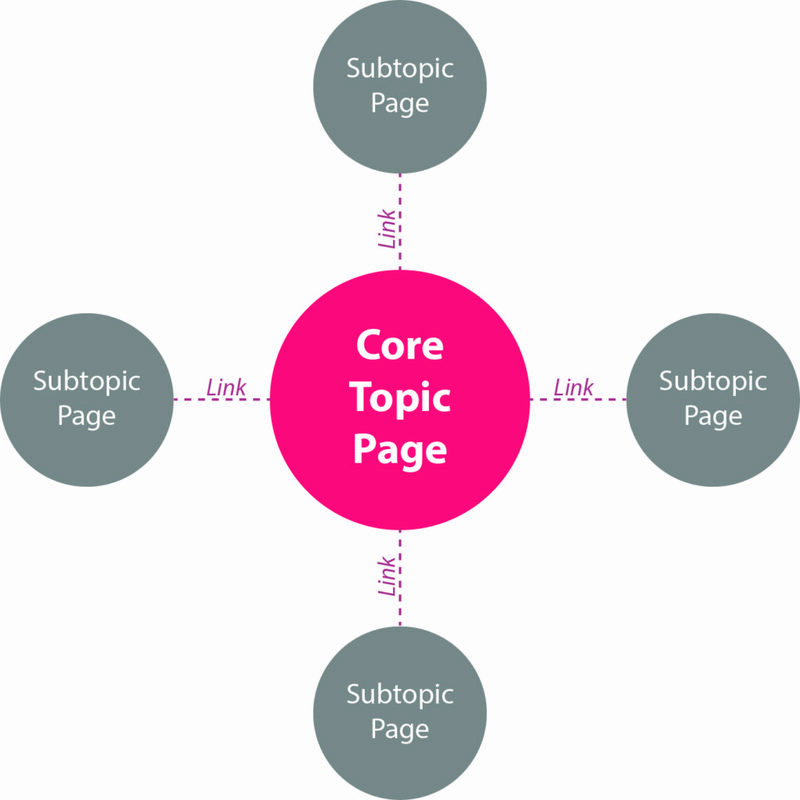 In order to improve page rankings for subtopic pages, SEO firms have been structuring their site architecture to use internal linking to drive traffic to pages with less traffic. In order to understand how topic clustering works, there are several levels of hierarchy that must be explained. First of all, the pillar page acts as the home of this specific topic. This page is where all the other subtopic pages are clustering into. Pillar topics encapsulate the broader range of topics that can be found within a site. Often times larger sites will contain a variety of pillar topics that help improve SEO for organic searches on more specific queries. The subtopic pages that are linking to the pillar page most often contain similar and related keywords or subtopics. The most important consideration for topic clustering is how well the pages fit with each other making sure those pages are linking to each other. One of the common misconceptions about this strategy is that you can divide your site into dozens of pillar topics. This makes the individual pillar pages less relevant and important because they have fewer subtopic pages and content linking to each page. In order to optimize your site’s SEO into specific topic ranges, you must identify your site’s primary pillar topics. The lowest level of the hierarchy is the actual content pages. These contain more granular topics compared to pillar pages. By linking these pages together in clusters, it improves the legitimacy of the pillar pages and improves the reach of less-trafficked content pages. Topic clusters have become more popular among content marketing firms due to a shift in both user behavior and search engine algorithms. With more consumers using long tail queries to find answers to complex questions, fragmented keywords can no longer drive the same amount of traffic as they used to. Current SEO experts now understand that search engines can now understand topical contexts. Whinston Chenery describes in his article, “Google can now pull better search results based on synonyms, abstract concepts, and natural language.” This means that a search query may result in topics that directly relate to their query and also subtopics that may contain similar keywords that are similar to the user’s intended topic. This creates an opportunity for search algorithms to search within clusters in order to dictate if a page is relevant and important enough for users. Topic Clusters allow for more sophisticated search engine algorithms to browse websites and increase site rankings based on how well content relates and how the site architecture structures information. This is a great opportunity for sites to boost their rankings. Consumers will also find much more relevant content as more sites structure content in clusters.